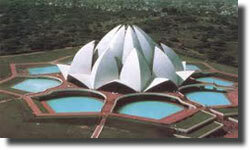 Lotus Temple located in modern Delhi is one h temple that facilitates the Bahai's Faith of Worship. The Baha'i House of Worship is one dedicated to the oneness of all religions and mankind. The other Subsidiary buildings that afford relief to the suffering, sustenance to the poor, shelter to the wayfarer, solace to the bereaved and education to the ignorant abound around the House of Worship. There is no clergy in the Baha'i Faith and its service consists of prayers and readings of selections from Baha'i scriptures and religious texts of the other faiths of the world. The temple represents the Bahai faith which is broad in its outlook and has scientific influence which exerts on the hearts and minds of men. It signifies the purity and the universality of the lord and equality of all religions. The Temple is visited by over four million people annually. This gleaming lotus- like marble structure is located on Bahapur Hills (South Delhi) and it is the seventh and most recent Bahai houses of worship in the world. This structure of the temple was completed in 1986, and is a marvel of modern architecture. Set amidst pools and gardens, the view of the temple is very spectacular just before dusk when the temple is flood lit. The Temple was built during 1980 - 1986 costing Rs 10 Million. The Temple is a Half Floating Lotus set amidst pools and garden. The petals are made of white marbles. The petals are made of special concrete clad with white marble, extracted from the Mount Pentitikon mines in Greece. It is the Only Bahai Temple of Worship in Asia. 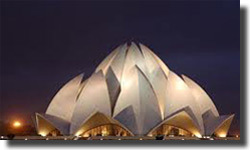 The Lotus Temple today is among the masterpieces of the 20th Century and also winner of International Prestigious Awards. This Temple has no Idols of any Deity and God. It has a Prayers Hall for Meditation for Faith of all Religions. One should always try to participate in Unique Prayer Sessions that Recite Teachings from All the Religions. It is carrried on approximately for 2 hours. One should also visit the Information Center Providing Information on Facts of Bahai Faith in form of Photographs, Written Texts and Film. Visiting Around: Nehru Place - Electronic Items, Kalkaji Temple and C R Park Market (Residential Markets), Greater Kailash-1 Market (Garments, Cosmetics, Curios). It is symbolic of the possibility of being spiritual and pure even in this materialistic world. The temple has a very large prayer hall where visitors of all faiths can meditate. The hall has no idols and no rituals and its daily public services include sections from the holy books of all religions. It is said about the Lotus Temple that "Architecturally, artistically, ethically, the edifice is a paragon of perfection" - a sentiment that is undoubtedly true. The lotus represents the Manifestation of God, and is also a symbol of purity and tenderness. Its significance is deeply rooted in the minds and hearts of the Indians. In the epic poem Mahabharata, the Creator Brahma is described as having sprung from the lotus that grew out of Lord Vishnu's navel when that deity lay absorbed in meditation; there is a deep and universal reverence for the lotus, which is regarded as a sacred flower associated with worship throughout many centuries. As in the legend of Buddhist folklore the Boddhisatva Avalokiteswara is represented and believed to be born from a lotus, and is usually depicted as standing or sitting on a lotus pedestal and holding a lotus bloom in his hand. Buddhists glorify him in their prayers, "Om Mani Padme Hum", "Yea, Oh Jewel in the Lotus!" Lord Buddha says you have to be like a lotus which, although living in dirty water, still remains beautiful and undefiled by its surroundings. So, we realise that the lotus is associated with worship, and has been a part of the life and thoughts of Indians through the ages. It will seem to them as though they have been worshipping in this Temple in their dreams for years. Now their vision has become a reality and God willing, some day they will all enter and worship in it. The history of the Bahá'í Faith in India started with the inception of the Faith in Iran when the Báb (literally, the Gate) inaugurated a new era in the history of the human race. The Báb Himself had appointed one of the Indian believers as the 'Letter of Living' in 1844-45, the first year of His Ministry. Since those times, India is spiritually connected with the Bahá'i Faith. In the year 1987, Lotus Temple has been awarded for the architect Mr. Sabha from International Federation for Art and Architecture, USA. It has also been awared the The Citation Award for personifying the visual impact of the beautiful Lotus flower. In the year 1988 given Accreditation for its outdoor illumination and has been awarded with American Concrete Institute Award for being one of the most artistically built concrete structures. In the year 2000, it received the "Glob Art Academy Award" from Glob Art Academy in Vienna. So, whenever you visit Delhi, do not forget to see this particular masterpiece which offers a strong message of wisdom, peace and tranquility. Visiting Hours of the Lotus temple are on all days except Monday. The Summer Timings are from 9:00 a.m. to 7:00 p.m & Winter Timings from 9:30 a.m. to 5:30 p.m. The Temple is famous for its exotic view during evening hours as the Lotus Temple glitters like diamond. Evening is the best time to visit. Tourists can either take local buses from various points within the city to reach this temple located in South Delhi, or they can take auto-rickshaws and taxis or metro rail. Hotel Park Royal, Karim's, Supper Factory and Salims in Kailash Colony Market, McDonald's and cosmopolitan eateries in Greater Kailash-1 Market, there are many good food joints in Nehru Place including Nathu's and Domino's Pizza, and many good restaurants in Kalkaji Market and C. R. Park Market. Delhi has two railheads - New Delhi Railway Station and Old Delhi Railway Station, both of which is connected to rest of India by several trains. Through road services Delhi has well defined road and can be reached from anywhere very easily. 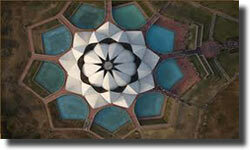 The Lotus temple is situated to the east of the intersection of Mathura Road (the way to Agra) and the outer Ring Road. Tourists can reach upto Nehru Place (the bus terminal is well connected to every part of the city), from where one can take an auto-rickshaw or walk for 15 minutes.